June 16th is National Flip Flop Day. This whimsical and fun national day of recognition seems quite appropriate for Hawaiian Falls, since flip flops are the normal summer attire for the majority of Hawaiian Falls’ guests. But we wanted to take it a step further, no pun intended! Hawaiian Falls will be teaming up with the oldest children’s charity in Dallas, Buckner International, on Friday, June 16th to help kids all over the world receive a new pair of shoes. New shoes put children on a path to health, education, hope and opportunity. 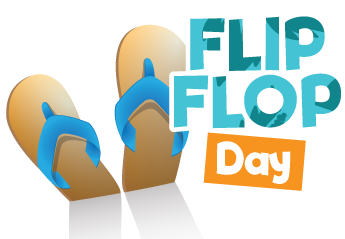 Guests that bring in a new pair of sneakers, sandals and even flip flops to any Hawaiian Falls locations on National Flip Flop Day will receive a special $5 off a general admission ticket. Buckner Shoes for Orphan Souls is the largest humanitarian aid project that Buckner handles. Donations are received by some of the most vulnerable children in the world. Buckner International has distributed shoes to children in over 80 countries. Places such as Mexico, Guatemala, Honduras and Kenya all benefit from the donations received from Buckner. Shoes protect against diseases and infections, lower barriers to school attendance, and demonstrate worth. Not only do they help kids overseas, they also support the local communities in the DFW area. Nearly 30% of shoes collected by Buckner remain in the United States. A lot of these shoes stay right in the state of Texas. Over 3 million pairs shoes and socks have been donated by Buckner since 1999. This summer, you can enjoy a fun day with the family while helping others less fortunate by participating in our shoe drive. Walgreens is currently selling discounted daily admission tickets and season passes, and this is also a perfect place to purchase a pair of flip flops or sandals for a good price. This is a chance to give back to your community, teach your children about giving to those less fortunate and help kids all over the world. No child anywhere in the world should be without shoes on their feet!